This page is written by the game's inventor, Tomas Forsman. Family Matters (small) is, like the name suggests, a smaller version of a variant named 'Family Matters'. The rules are the same but the board and the number of pieces are different. In the (small) version you don't have any Pawns and no Knights. You still have the new pieces 'Prince', 'Princess' and 'Childs' though. More about them below. In family matters two royal families are fighting for the crown. The old King is dying and wants to leave the kingdom to someone with heirs since he himself didn't have any. Both Kings have the same idea, to keep the other from showing up or to make it look like he has no heirs by keeping them from showing up. The board, with the middle square, and the new pieces forces a quicker game then chess where you really have to think about every move. One false move can loose the game for you. The idea for Family Matters (small) came when I saw this competition. I had just finished Family Matters which is a large variant on a a four player board. In turn the idea for Family Matters came when I was programming a four player chess for Zillions-of-games. Both of the games are open for many variants by just adding a little to the rules. The two games don't differ a lot in rules but when it comes to game play they are nothing alike. To capture either the enemy King or to capture all Princes and Princesses. The board is made of 41 squares. The middle square can be used when walking diagonally. 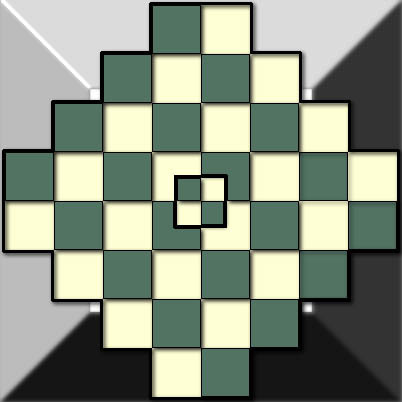 This can be used by the bishops to change what colored squares it moves on. Any legal diagonal move from d4, d5, e4 or e5 can stay in the middle square. The code for the middle square is 'i1'. In Promotion zones a Child becomes Prince or Princess. They are located on the opposite side of the Child pieces. 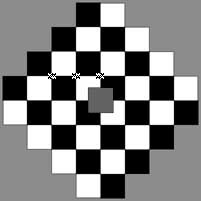 All the ordinary pieces move like in normal chess with the exception of the usage of the middle square. When you stand on i1 you have to move diagonally out of it. A Child moves one step to the side and captures diagonally up and down to the side it moves. White children move from left to right and Black from right to left. If a child reaches the opposite side (the Promotion zone) it becomes either a Prince or a Princess. If a capture brings a child inside the middle square it is trapped there until it can catch someone outside or is captured. The Prince can either move one step diagonally in any way or jump two steps up, down, left or right. 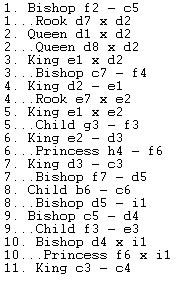 The Princess can move one step right, left, up, down or jump two steps diagonally (remember that i1 is one diagonal step). In the beginning of the game it is a lot about what to sacrifice for what. Follow these moves and see the use of the i1 square. As you see the Children, Princes and Princesses are left out of the first moves. Every time you change the rules, even if it is just a little, the strategy of the game becomes totally different. Here are some nice variants for Family Matters (small). Replace the Rooks and the Bishops with Princes and Princesses. The new Princesses should stand on the white squares and the Princes on the black ones. Only Princes and Princesses can capture enemy children. This enhance the role of the children in the game. In the middle square a Queen of a new color is placed. This Queen can only move one step in any directions and every time it is your turn after you have made your move you can choose to move the neutral Queen. The Queen can't capture Children and she can't be captured. This simulates the Old Kings' Queen who wants the power herself and are determined to kill both royal families. The same as above but the computer moves the queen one step in a random direction every time both have made their moves. Imagine a crazy old lady walking around the halls with a knife determined to kill everyone she meets. She still can't kill Children. If you write a strategy or variant to this game, please send it to me on (email removed contact us for address) designer.com and I will try to include it in the game. You can download both Family Matters and Family Matters (small) without variations here. Family Matters Chess and Family Matters (small) Chess are both Copyrighted © by Tomas Forsman 2001. The images were missing. They were also missing from the last CD ROM I got of the whole site. I don't know why the images were missing, but I managed to retrieve them all from archive.org. So they're back. None of the images appear to load.